Projector's Talks are informal meetings with marketers. This format is about a discussion where experts will share their expertise and you can ask questions. 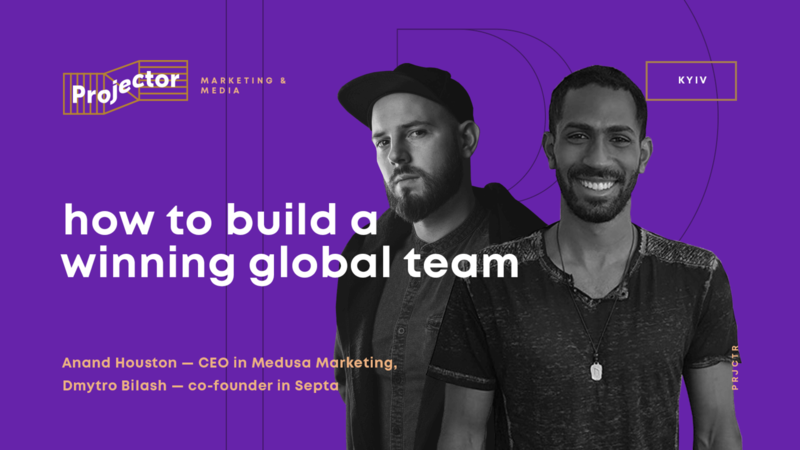 Anand Houston — CEO in Medusa Marketing. Anand is an up-and-coming global influencer. He currently is the owner of an advertising agency, an investment firm, and an e-commerce website. His companies together have brought in over $1M within less than one year. Dmytro Bilash — co-founder/managing partner in Captain Growth, co-founder/managing partner in Septa. Earlier, Dmytro ran his own digital agency, having on board global clients and offices in 2 countries, but once he decided to change everything and go into data science. That is how Captain Growth was created, an AI-based service for marketing analytics. Captain Growth took the TOP-3 place on the Product Hunt. During the first month after the launch, Uber, Booking etc. was connected to the product alongside with 1500+ companies all over the world. Ukrainian and American point of view on a business process. Facebook Media Buyer/Google Ads specialist or people who make ads. It's your place for networking as Anand is also hiring people in Meduza Marketing team. Light drinks and friendly atmosphere guarantee. Join us!